There is no better example of a popular art form that took its inspiration from the Torah and Talmud than Jewish papercuts, all of them serving some religious, ritual or mystic purpose. Many of the objects that we revere and treasure today as traditional Jewish folk art were made of expensive materials according to accepted patterns and styles of the day and region by skilled by craftsmen — often non-Jews commissioned by private individuals or congregations. But even the poorest Jew had access to the humble materials and tools — paper, pencil, penknife, watercolors and colored crayons — with which he could express his own form of hiddur mitzvah [beautification of the commandments and rituals] by making a papercut. Of all Jewish ritual and folk art, papercuts (and also some calligraphic sheets) lent themselves to the freest expression of religious spirit. Unlike metal, wood, or textiles, paper was so cheap and so easily replaceable that the artist-craftsman was never afraid of spoiling it. He could be bold and inventive within the simplest of technical means. And indeed, he took full advantage of the medium and let his imagination run to fanciful extremes. The earliest known reference to a Jew who created cut paper work dates to 1345, when Rabbi Shem-Tov ben Yitzhak ben Ardutiel composed a witty treatise in Hebrew entitled The War of the Pen Against the Scissors. He relates that when the ink in his inkwell froze on a cold winter’s evening, he resorted to cutting the letters out of the paper–apparently in keeping with a conceit fashionable at the time (and later) in Spain. To students of Christian Spanish literary history, Rabbi Shem-Tov is better known as Santob de Carrion de los Condes (1290-1369), the courtly Castilian troubadour who composed the Proverbios morales for Pedro the Cruel. Individual Jews (including an apostate) proficient at making papercut images are mentioned here and there in Dutch and German writings of the 17th and 18th centuries. Later, a notice of 1853 tells of Jews in Amsterdam selling cut out pictures of Catholic prelates hanging from a rope, as part of Protestant opposition to the reestablishment of a Catholic hierarchy in the Netherlands. At most, such incidental bits of information indicate that some Jews also engaged in papercutting–not an unusual practice at the time. It provides no meaningful clues as to how the making of devotional papercuts started and spread through the Jewish world. From around the mid-18th to the mid-19th centuries we have Italian — or at least, Italianate — ketubot (marriage contracts) and megillot Esther (scrolls of the Book of Esther read during Purim), in which the parchment or paper of the border design or of the illustrative vignettes was cut out in three parts But here, too, we cannot conclude that these inspired the Jewish folk tradition of paper cutting that was practiced concurrently. Among the earliest known or recorded Jewish papercuts as such, very few can be dated with certainty to the latter part of the 18th century. Most of the items known today range from the early 19th century to the first decades of the 20th and were made in Central or Eastern Europe — Alsace, Germany, Bohemia, Austria-Hungary, Galicia, Poland, Lithuania, White Russia, the Ukraine, Volhynia, Podolia, Rumania; in Turkey and parts of the Ottoman Empire, French North Africa, Syria, Baghdad and Palestine; and also migrants to North America and Western Europe. Since the earliest, datable, surviving Jewish papercuts of the late 18th century already reflect a distinct folk-art genre, they attest an older tradition. That so few items remain is not really surprising considering the extreme fragility of their construction and the vulnerability of the material. Some of the simpler designs were made for special occasions, and because of their ephemeral character were little valued and discarded after being used only once or twice. The Holocaust marked the disappearance of much Jewish ceremonial and folk art; the more so of such frail items as papercuts. Among a highly literate people like the Jews, paper was always on hand, even among the poor, and especially after the introduction of cheap wood-pulp paper in the mid-19th century. 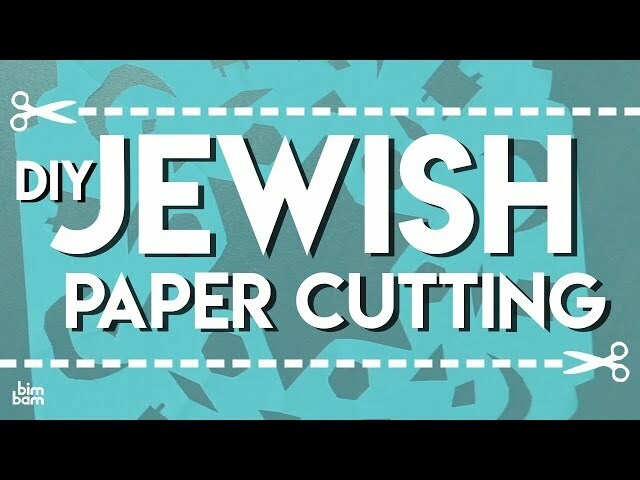 The more we learn about Jewish papercuts in one form or another, the more reason we have to believe that they were once exceedingly common, at least in Ashkenazic-Jewish homes. They served daily religious and other ritual needs, such as indicating the direction of prayer (mizrach, shivitti, menorah), decorating the home for holidays (omer calendars, shavuosl/roisele, ushpizin, etc. ), warding off the evil eve (shir hamalos/kimpethrivl, menorah), remembering family deaths (yahrzeit) and the like. These papercuts feature most of the traditional symbols and inscriptions found in Jewish ceremonial objects and amulets —many of them kabbalistic [mystical]— characteristic of the various Diaspora communities. The real or fantastic animals and birds, vegetation, utensils, urns, columns, the menorah, tablets of the law, stars of David, the signs of the 12 tribes and of the zodiac, yadayim/hamsas (an upside-down hand), eternal lights/lamps-in-niches, and the like, which appear and reappear in the compositions, had almost all meanings that were wide; if not universally understood in the community. They were supplemented with calligraphic inscriptions in Hebrew (and sometimes in other languages), mainly passages from the Bible, the interpretive and homiletic texts, the prayerbook, cryptograms, acronyms, wise sayings, and magic formulas and incantations. Personal dedicatory and memorial inscriptions commemorating special family events were sometimes included as well. And occasionally — to the delight of those of us who crave to know more about them— the name of the maker of the papercut, the date and place, and the name of the owner are indicated. Before launching into more detailed characterizations of this intensely parochial Jewish folk art, we must establish an important criterion for assessing Jewish papercuts: the statistical basis for drawing generalized conclusions. Or, in other words, how many old Jewish papercuts are known to exist today, or are at least recorded photographically. Here we must define the term “classic” that we have adopted for our discussion: We distinguish “classic” Jewish papercuts and papercut compositions from simple— generally small cutouts such as were made by children to paste on windowpanes for Shavuot and for the sukkah, and also from ketubot and megillat Esther with cut-out decorative borders. However, size is not a criterion, for “classic” Jewish papercuts can vary from very small to huge, from less than 10 centimeters to over one meter in height or width. All of these were intended to serve the purposes outlined above and reflect religious or apotropaic concepts representing extensive knowledge of Jewish lore. They bear appropriate inscriptions, many of decided esoteric purport, and show meticulous planning and painstaking execution. Thus — not counting possibly several hundred smaller, plain, shavuosl/roisele-type of paper cutouts, many of them made by young boys, or the relatively few ketubot and megillot Esther with cut-out decorative elements — we know of no more than about 250 or so “classic” Jewish papercuts, both existing ones and photographs of lost items, to give us a glimpse into the widespread Jewish paper cutting tradition, from the earliest known ones of the mid-18th century to the 1950s. Of these, more than 80 can be ascribed with fair certainty to Galicia and the adjacent Carpathian Mountains regions; some 30 to 40 to Poland proper and the Russian Pale of Settlement; at least as many to Central Europe, from Alsace in the west through Germany to western Poland, Bohemia-Moravia, and Germanic Austria-Hungary; 25 or so to the United States; and about 30 to 40 Sephardic papercuts, of which about one-third stem from Ottoman Turkey and two-thirds from the lands of the Maghreb in North Africa. A few come from north Italy, Palestine/Syria, and Baghdad. Others are of indeterminate, varied provenance. Since most of the Jewish papercuts from the United States, and the few in England, were the work of Polish and German immigrants from Central and Eastern Europe carrying on their traditions, many of these show and match affinities with the Jewish work from German-speaking, Galician, and Polish/Russian regions. Among the relatively small number of known and recorded Sephardic papercuts are several items made by the same persons, and their dating is also largely concentrated within a few decades around the end of the 19th and the turn of the 20th centuries. Being true folk creations, Jewish papercuts were made for a closed group or society. Just as Chinese or Mexican papercuts and Turkish or Greek shadow theater figures are unmistakable and can be spotted at a glance among any international selection of cut-out work, so traditional Jewish papercuts are also readily identifiable — not only because of specifically Jewish symbols and inscriptions, but also by their special character. And this is true despite any non-Jewish influences. Reprinted with permission from Traditional Jewish Papercuts: An Inner World of Art and Symbol (University Press of New England).